Since 1980, Viive has owned and managed four companies including Graffiti Magazine, an international award-winning music/lifestyle publication in the 80s. For twelve years, Viive has been on Canada’s Top 100 Women Entrepreneur’s list. As a founder of Tamm and Kit, she stewarded this Toronto-based advertising agency onto Canada’s coveted ‘Top 100 Employers’ list ~ the first advertising agency to ever receive this designation. Viive is also the operating partner of The Pickering Markets, Canada’s largest indoor flea market. Having served on several boards, Viive was the Chair of Operation Migration about which the movie ‘Fly Away Home’ was based. Serving as Board chair since 2008, Viive has spearheaded a number of initiatives that have helped GR grow both in size and notoriety. She led a team to revamp GR’s re-branding including the creation of the logo and website, redevelopment of the Guardian newsletter into a full-color 16 to 20 page quarterly publication, and overseeing ‘Golden Reflections’ ~ our anniversary coffee table book. Viive also instigated LCBO Tag Days, which is now one of GR’s biggest awareness builders and fundraisers. In the past, she helped organize the golf tournament and car rally. She helped create the Wishbone Lottery, which is currently our major fundraiser. 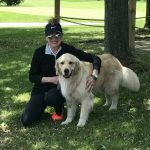 Along with her fellow board members, she helped initiate the Istanbul Mission of Love which has brought hundreds of Goldens to Canada, creating major publicity and notoriety for GR. Her furkids Mr. Bibbs, Zoey #1526, Garci, and Oakley #2071 (all rescues) provide her with her inspiration. Jane came to Golden Rescue as a volunteer when she adopted Dylan #1124 in 2009. Dylan was a tripod who came to Golden Rescue from a very bad situation. His early hard life took a toll on him both physically and emotionally. He bit his first two foster families and was basically on his last strike when Jane adopted him. Jane would later say that he really rescued her. Over time and with much love and patience on both sides, Dylan became a Golden who could be trusted in any situation. Jane says he opened her eyes to how many wonderful dogs are just waiting for second chances with loving forever families. And that is what motivated her to get involved with Golden Rescue and advocate for canine rescue everywhere. Jane is a proud volunteer who served as the Chair of the Golden Rescue picnic for four years and has served on the board since 2012. She is currently the Vice Chair. 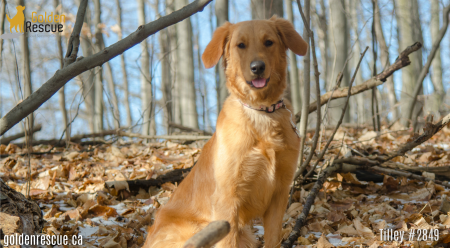 She shares her home and her heart with four amazing Goldens ~ Abby, Bear #1679, Beecher, and Daisy #2226. Both Patti and her husband Harry are great GR supporters. Starting on the hotline, Patti helped wherever she could, including working at our general store and registration for our annual picnic. She eventually joined the intake team and is now our Director of Golden Care. Patti and Harry do behaviour evaluations, home visits, and transports and are picnic sponsors. Patti is very active on the Kijij, shelter, and personal ads online response team. Outside of GR, they run their own company, Matheis Financial Group. 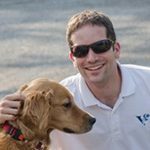 Stewarding their dog-and-cat friendly company to success takes most of their time. They both love to travel and spend time at their beloved cottage in the Kawarthas with their Goldens Boomie #2198 and his new brother Atlas #2326, who came all the way from Istanbul. Sharon was elected Treasurer in the fall of 2010. She has recently retired from the Windsor Essex County Health Unit as the Director of Corporate Services. She is a member of the Chartered Professional Accountants of Ontario and has a B.A. and a Hons B. Comm from the University of Windsor. Sharon and her husband Gary became aware of Golden Rescue in 2009 when they adopted Max #1249 as a companion for Nellie when their other Golden, Morgan, was diagnosed with cancer. They currently share their home with Callie #2036 and Reggie #2349. Sharon thinks that volunteering with GR continues to be very rewarding and the perfect Golden matches are the icing on the cake. 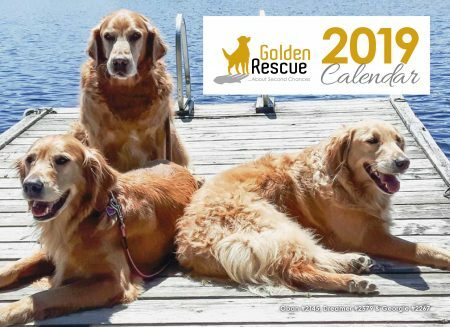 Christine’s work with Golden Rescue is in honour of her three beauties, Jake, Josey, and Ella-Blu (pictured) ~ whose resiliency and sense of curiosity have served as a constant reminder that all Goldens should have a chance to live well. Volunteering with Golden Rescue had been on Christine’s radar for a long time when she joined the hotline in 2014, eventually becoming the team lead. 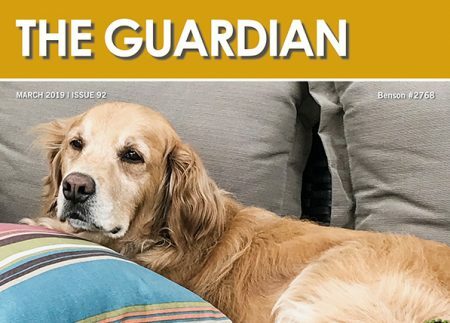 Seeking out additional responsibilities, Christine began writing web content, Guardian articles, and other marketing materials and liaised with media when Golden Rescue initiated its Istanbul rescue mission. Christine is an experienced service culture consultant and coach, designing customer experience improvement strategies for clients in hospitality, healthcare, and the automotive industry. Most recently, Christine was Vice President, Customer Experience, for a national seniors’ healthcare organization. Prior to this role, Christine led the global rollout of Starwood Hotel’s customer experience transformation program as Director, Service Culture, working throughout North America, Europe, and the Middle East. In both of these roles, Christine’s resolute focus on service obsession has helped organizations discover untapped resources for creating brand, product, and service relevance for customers. 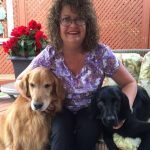 With a career that began as an English teacher in York Region and evolved into corporate roles in communications, media relations, and service culture improvement, Christine brings a breadth of communications experience and ‘people’ knowledge to Golden Rescue. Christine is also an avid golfer, an abstract artist, and has a passion for interior design and renovation. 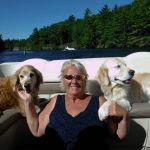 Cynthia first became aware of Golden Rescue in 2007 when she found us on the internet and became an adoptee, welcoming Fred #801 and Ginger #802 into her life. Cynthia resides in Toronto and has worked for one of the largest privately-owned lumber companies in Ontario for almost 20 years. Cynthia was educated in Civil Engineering at Seneca Collage. She began volunteering her time with GR eleven years ago becoming involved in many aspects of the organization including fundraising, most notably the golf tournament. Currently, Cynthia is the team lead of the Wishbone Lottery, GR’s major fundraising initiative. She also monitors and responds to our website emails, fosters, and volunteers at events and with inventory. She has recently added a new member to her family, sweet Lily #2253. 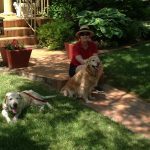 Patty, a staunch Golden Rescue supporter, graduated from the University of Missouri College of Veterinary Medicine. After three years of practicing veterinary medicine in Las Vegas, Patty moved to Ontario. In 1989 she joined Allandale Veterinary Clinic as the only small animal veterinarian. 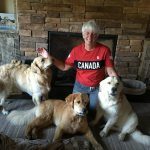 Today, Patty is the sole owner of Allandale Veterinary Hospital, a brand new, five-veterinarian, state-of-the-art veterinary hospital in Barrie. 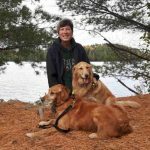 Patty serves on a number of boards, both veterinary and non-veterinary, loves Goldens, and has always been impressed with the dedication and care provide by Golden Rescue. Monica and her husband Chris have been active GR volunteers for over 13 years. They first got involved when they adopted their beloved Toby #422. They initially volunteered for the massive job of transferring GR’s files from paper to digital; however, they have put their hands up to help in so many other ways over the years including home visits, behavior evaluations, and their considerable work on adoption follow-up calls. More recently they have been involved in the Istanbul Mission of Love, assisting with social media and transport. 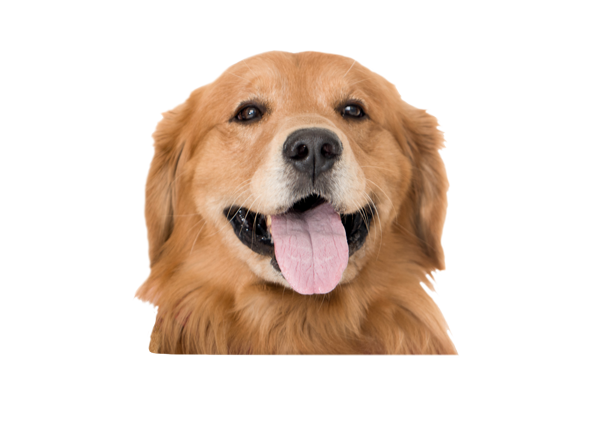 Since Toby, they have adopted four Goldens and now share their lives with Oban #2125 and tripawd Georgie #2267 (George Burns from Istanbul). Monica joins the Board as Events Director to continue GR’s mission of attending events to create awareness about the organization and to educate the public about responsible pet ownership. When Paul and his husband Mike adopted their aptly-named Golden, Phoenix (pictured), they figured they had rescued him just in time. With a rocky start to his life, Phoenix was cautious around people, especially men. Paul and Mike, who had recently lost their previous golden, Buddy, had decided to take a break from having a fur kid in the house; however, when they found themselves talking to a stuffed teddy bear, they realized they needed another dog… and fast. After only a few weeks with Phoenix, a strong bond was formed among this dynamic trio and they realized, like so many adopters, that Phoenix had also rescued them… just in time. Paul, a professional fundraiser, has spent more than 20 years working for some of Canada’s most respected and successful charities. Starting his career in Vancouver, he felt fortunate to land his first role at BC Children’s Hospital supporting the fundraising team in a marketing capacity. Despite being blissfully happy with the team and cause, he accepted a new challenge with another children’s hospital as Manager of Annual Giving at the IWK Health Centre in Halifax. The cross country move meant a lot to him professionally and personally as he was moving back to the city where he grew up. While working in a Major Gifts fundraising role at Dalhousie University, Paul met Mike and they moved to Toronto where Paul worked for ten years at Children’s Miracle Network, raising funds for children’s hospitals across Canada and for two years at Breakfast Club of Canada. Most recently, Paul dived into a new role as National Director, Partnerships at Ronald McDonald House Charities of Canada. 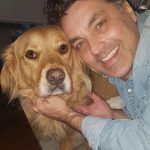 As so much of fundraising is based on storytelling, Paul is excited to put his experience, and first- hand experience as an adopter, to work at Golden Rescue, telling its amazing stories. 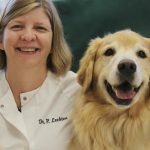 Karen has been involved with animals most of her life ~ first as a Registered Veterinary Technician for over 20 years working in some well-known clinics, including the Emergency Veterinary Clinic in Toronto. In more recent years, Karen runs her own business as a virtual administrative assistant, which has been so successful that it has given her more time to return to her real love of helping animals. 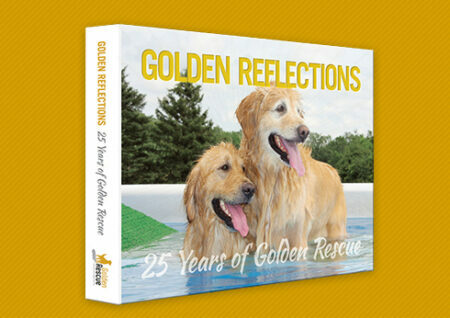 She came across Golden Rescue and offered her home to two Goldens ~ Amber #233 and Stanley #545. 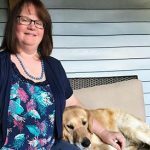 Karen volunteers a great deal of her time to Golden Rescue and used her love of Goldens and her administrative skills to help develop and lead the Volunteer Coordinator and Inquiry Volunteer Coordinator teams. 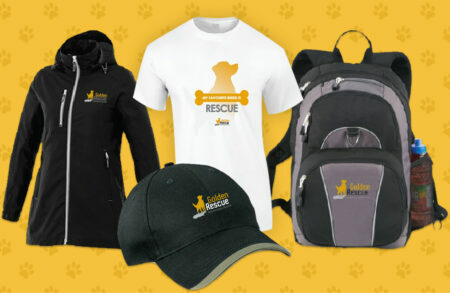 With these teams well established, Karen is taking on the added responsibilities of overseeing the data team and managing our online store (www.goldenrescuestore.ca). Karen enjoys sourcing new and exciting products and liaising with customers. 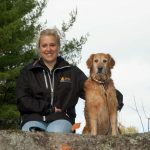 Ben is the proprietor and full-time dog wrangler at Viamede Resort ~ a small, dog-friendly resort in the Kawarthas. There he unites his passion for food, hospitality, and animals. Ben attended hotel management school in Switzerland and has worked all over Ontario in hotels, restaurants, and resorts. Ben works closely with the Kawartha Land Trust to conserve land. Ben adopted Maggy #1622 and gave her a wonderful, albeit short, life. Ben fosters for us and adopted Toby #2000 and Daisy #2221 ~ Viamede’s resort dogs. Ben is the Picnic Chair and Viamede is hosting the 2016 and 2017 Annual Picnic. Give the Gift of Rescue Today! 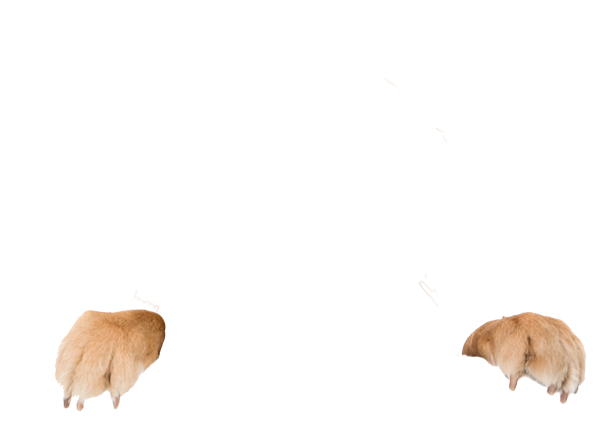 You’ll receive updates whenever a new adoption notice is posted on this site as well as updates on upcoming Golden events!